As e-business quickly becomes the norm, virtually every enterprise must establish its Internet presence.But it can do more harm than good to tie your business to a web site with sluggish response and intermittentdowntime. Load balancing products help enterprises to create high-availability presence withina single location. Geographic load balancing goes one step further by enabling growth across manylocations, creating a distributed Internet presence that dramatically improves end-user experience andup-time while reducing overall cost of operation. 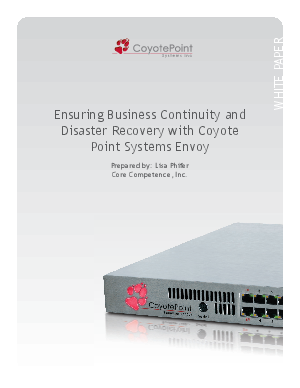 In this paper, we’ll explore how to use Coyote Point’s Envoy to ensure 24x7 availability and fast connections for web content deployed at more than one geographiclocation.